Advanced joint care is clinically tested to increase activity*. 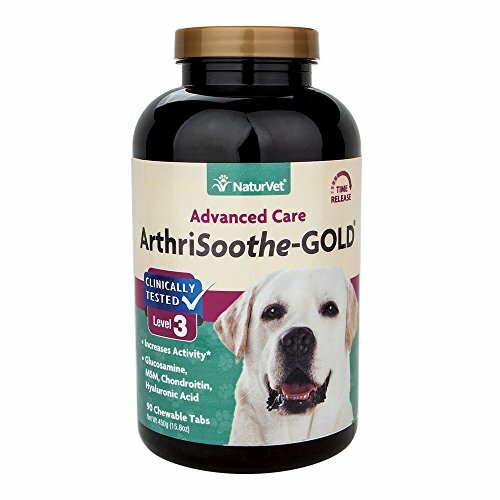 Perfect for pets in need of advanced joint care, such as senior pets, pets recovering from joint related injuries or surgery, or when the most support is needed. Helps support synovial fluid that lubricates the joints and to maintain cartilage and connective tissues. Helps to maintain joint flexibility and alleviate aches and discomfort associated with daily exercise. Contains Glucosamine, MSM, Chondroitin and Hyaluronic Acid to help support healthy hip and joint function and alleviate aches and discomfort associated with daily exercise. Provides advanced support to helps support structural joint integrity and connective tissues. Chewable, Time Release Tablets 90ct for Dogs and Cats. Recommended to double the suggested daily amount for the first 3 weeks. Active Ingredients: Glucosamine, Methylsulfonylmethane (MSM), Chondroitin Sulfate, Green Lipped Mussel, Proprietary Enzyme Blend, Boswellia serrata, Yucca schidigera, Calcium Ascorbate (Vitamin C), Zinc, Hyaluronic Acid and DL-alpha-tocopheryl acetate (Vitamin E).